Tony Blair and George W Bush decided to invade Iraq weeks earlier than they have admitted, a new book by a human rights lawyer has claimed. The book by Philippe Sands says the two leaders discussed going to war regardless of any United Nations view. And it suggests the US wanted to provoke Saddam Hussein by sending a spy plane over Iraq in UN colours. Downing Street said on Thursday it did not comment on discussions that "may or may not have happened" between leaders. The revelations come in an updated edition of Mr Sands' book Lawless World, which caused controversy when it was first published early last year. The government has always insisted military action was used as a last resort against Saddam Hussein's regime. 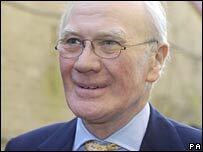 Sir Menzies Campbell says there was a "rush to war"
Mr Blair told MPs on 25 February 2003: "Even now, we are prepared to go the extra step to achieve disarmament peacefully." But the new book centres on a meeting between Mr Bush and Mr Blair at the White House three weeks earlier, on 31 January. Professor Sands, a QC and professor of international law at University College London, says the two-hour meeting was also attended by six advisers. The book quotes from a note it says was prepared by one of the participants. According to the note, Mr Bush said the military campaign was pencilled in for March. Mr Blair is quoted as saying he was "solidly with the president and ready to do whatever it took to disarm Saddam". The book claims Mr Blair only wanted a second UN Security Council resolution because it would make it easier politically to deal with Saddam. And it says Mr Bush told Mr Blair the US "was thinking of flying U2 reconnaissance aircraft with fighter cover over Iraq, painted in UN colours". 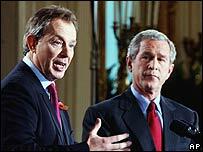 If Saddam fired on them, the Iraqis would be in breach of UN resolutions, he suggested. Mr Bush is also quoted saying it was possible an Iraqi figure would defect and be able to give a "public presentation" of weapons of mass destruction. The note said Mr Bush thought there was also "a small possibility that Saddam would be assassinated". The book also claims the president "thought it unlikely that there would be internecine warfare between the different religious and ethnic groups". It also claims the note reveals the two leaders discussed a number of options. A Downing Street spokeswoman told BBC News the events leading up to the war had been thoroughly investigated. A spokeswoman said the prime minister only committed UK forces to Iraq after securing the approval of the House of Commons on 18 March 2003. The decision to resort to military action into Iraq fulfilled the obligation imposed by successive UN Security Council resolutions after other routes to disarm Iraq had failed, she said. The spokeswoman said No 10 did not comment on conversations between the prime minister and other leaders. In the US, Frederick Jones, chief spokesman for the National Security Council, said the White House would not comment on what was said or not said in alleged private conversations between Mr Bush and foreign leaders. Mr Jones said the White House "was not going to re-litigate how the nation went to war". Acting Liberal Democrats leader Sir Menzies Campbell said Mr Blair had "a lot of explaining to do" and a full inquiry into the Iraq decision was now "imperative". "It would appear that the diplomatic efforts in New York after the meeting of January 31[for a second UN resolution] were simply going through the motions, with the decision for military action already taken," he said. Sir Menzies said the suggestion that the US considered using their military aircraft in UN colours to provoke Saddam Hussein "illustrates the rush to war".